A prominent speedrunner says he’s been banned from participating in all future events hosted by the charity organization Games Done Quick after he gave marijuana to a friend at the most recent speedrunning marathon. 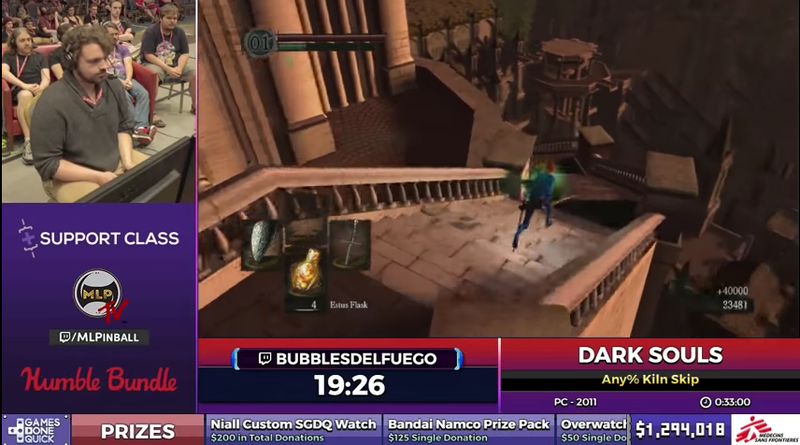 BubblesDelFuego, a speedrunner known for Fallout 4 and Dark Souls speedruns, said Friday on a Twitch stream that he had been taking marijuana edibles to treat chronic pain. He was diagnosed with Hodgkin lymphoma at age 17, surviving the condition thanks to early detection and later beating the cancer again at the age of 19. Since then, he has been taking medical marijuana to help alleviate lingering pain. BubblesDelFuego said he shared a portion of his edible with a friend. Eight hours later, as the edible’s effect wore off, BubblesDelFuego’s friend experienced a panic attack and was taken to a local hospital by paramedics. As police arrived on the scene and GDQ staff became aware of the situation, GDQ staff asked BubblesDelFuego to leave the venue. During a live run for Star Wars Jedi Knight: Jedi Academy where he was providing commentary, you can see BubblesDelFuego checking his phone before leaving the commentator’s couch. Games Done Quick has banned or temporarily suspended runners in the past for incidents involving political apparel and runner profanity. As the event has grown, organizers have taken extra steps to cut down on perceived controversies and community toxicity. During AGDQ 2018, they set their Twitch chat to subscriber-only mode in an effort to cut down on spam and hate speech. Games Done Quick’s rules specify that any individual attempting to enter the event while under the influence of illicit substances is subject to possible disciplinary action. First-time offenders receive a verbal warning while a second offense is grounds for being removed from the event “with the possibility of banishment from future events.” The rules urge caution for individuals in possession of medical or recreational marijuana. When contacted by Kotaku via email, a representative of Games Done Quick said: “As a company policy we do not publicly discuss enforcement actions.” Games Done Quick’s rules specify that regardless of the situation, individuals found in violation of local laws are still subject to discipline. Awesome Games Done Quick 2018 took place in Herndon, Virginia from January 7th to 14th, raising $2,294,612 for the Prevent Cancer Foundation. At the time, Virginia had yet to adopt widespread medical marijuana laws. In February, the State Senate and House of Delegates voted to allow doctors to recommend their use for the treatment of any diagnosed illness or condition. Correction - 11:55am, March 6: We’ve corrected the post to note that the BubblesDelFuego said the panic attack occurred eight hours after consumption, not one. We’ve also corrected two quotes to accurately match what was said by Bubbles’ about avoiding “fees and jail” (not “fees in jail”) and to clarify that he says he is “not” done speedrunning. We apologize for the errors.